For Aristides and Jane Pappidas, art is a lived experience – creating it, making it come to life on stage, and being surrounded by the work of other artists. 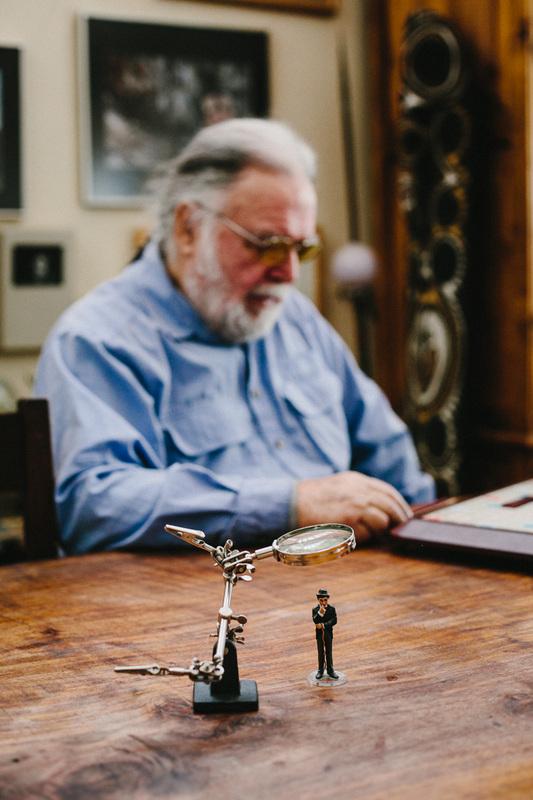 Their house is filled with paintings, photography, and at least one hundred hands from around the world – antiques, religious icons, and even kitschy souvenirs. Outside, birds flutter around geometric sculptures on their way to feeders. VIEW the ART Magazine center spread featuring Jane and Aristides – CLICK HERE. 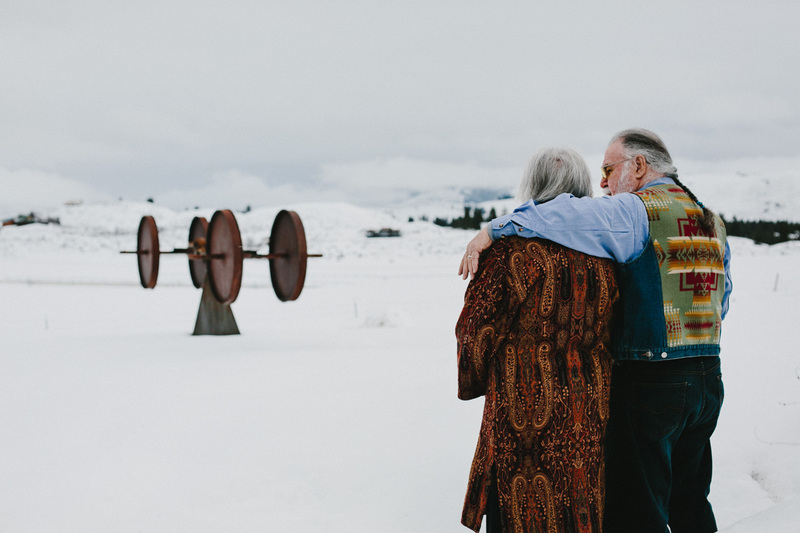 After spending most of their lives in and near New York City, Aristides and Jane have spent the past 14 years in the Methow Valley, where they have flourished as artists. 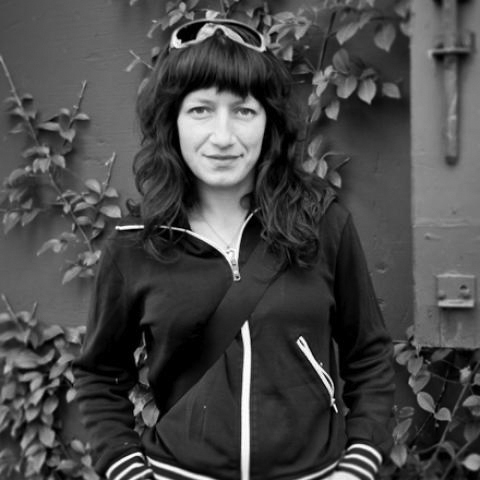 Aristides has used his photography to explore themes he has found compelling throughout his career, and Jane has acted in 13 plays and directed several more. Their careers in art span half a century. They took root in an urban world thousands of miles from the Methow Valley. In the 1960s, Aristides and Jane were among the first artists to settle in former manufacturing warehouses in New York City’s SoHo. Aristides remembers having to make his darkroom and studio presentable when inspectors came to verify that he was a working artist. Jane was acting in regional theater. But after their son, MacLeod, was born, they found New York a nerve-wracking place to raise a child. Aristides recalls riding his bicycle uptown – during rush hour – with MacLeod in a seat on the back. “I expected that a child would be a buffer from the nastiness,” he said. Instead, he raged at a taxi driver who got too close. “Luckily, the guy saw he was dealing with a lunatic,” he said. Aristides and Jane escaped their increasingly crowded and expensive neighborhood, moving to an aging industrial city in New Jersey beginning to be colonized by artists. Decades later, they were thinking about retiring to Toronto when the 9/11 attacks – which they saw erupt just across the Hudson River from their home – shattered those plans. Still, they’ve always had an affinity for rural life. They used to retreat to an old farmhouse in upstate New York as an antidote to the city, and their work schedules often allowed them to spend weeks at a time there. Aristides made his living as a film technician, doing lighting for movies. While commercials were his bread and butter, he occasionally had the chance to work on a documentary or a feature film in Hollywood. But his artistic interests in film extended beyond lighting. “I probably wanted to write and direct feature films,” he said. He wrote several scripts and collaborated on one with a partner, which they tried to sell to film houses. When they got a $3,000 offer right away – for their idea, not the script – they got a little cocky and turned it down, he said. But after two dozen more attempts, they never got another bite. Aristides concluded he didn’t have the single-minded ambition necessary to succeed in that competitive market. Aristides also created what he called photo assemblages. The assemblages were multi-dimensional triptychs, where the object was presented in three ways – part intact, part altered or destroyed, and then in a photo. It was a way of exploring an object from several perspectives at once. Aristides’ sensitivity to darkroom chemicals ultimately forced him to put his photography aside. But when he moved to the Methow, the luxuries of time and digital technology enabled him to take it up again. Many of his recent projects have been inspired by the landscape of the Methow, in cultural and aesthetic terms. “I have this desire to record certain moments in my life. I have no natural skills – I can’t draw – so photography made this possible,” he said. Aristides is still intrigued by investigating a subject from multiple perspectives. His first Methow photo project is a series of landscapes, each containing a mirror. The mirror may be propped in the snow or leaning against barbed wire, angled so that it captures a mountain or a river that would otherwise be beyond the frame. He still marvels at how the view changes so dramatically in every direction. “The mirrors solved that. This place is so extraordinary that I would like to see more of it at a time,” he said. Aristides liked how the truck windows framed the compositions. But the trucks also helped the dogs feel comfortable and, after striking up a rapport, Aristides aimed to capture the dog’s initial expression. Most of the dogs look at the camera, curious but relaxed. Many have a sense of majesty about them. 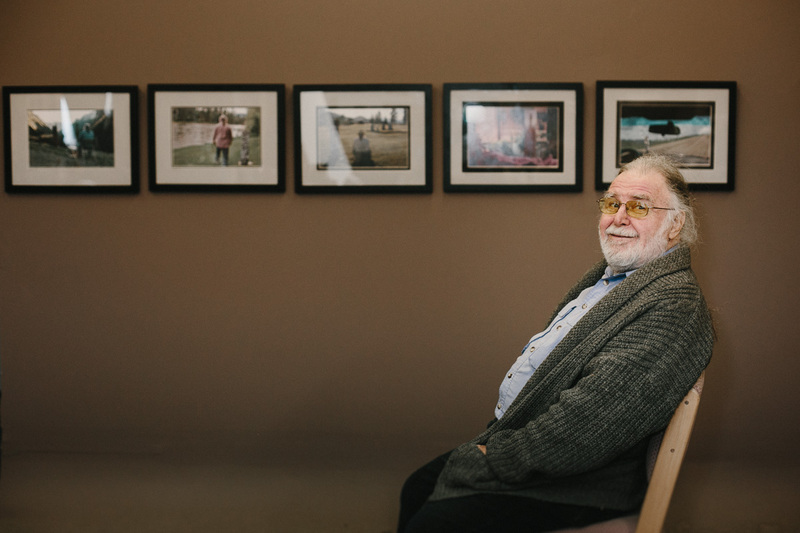 Aristides has recently been exploring the experience of aging through his photography. In one portrait, an old man rests against a huge Ponderosa pine snag lying on its side. Framed by the tree, the man radiates a sense of dignity that can only come from a long, full life. There is a certain symmetry between the lines on his weathered face and the texture of the bark. Aristides is also working on what he considers his final series, a wry look at aging and his own mortality. “I’m able to take a small aspect of the abyss and translate it into photography,” he said. One photo shows a fresh grave under a starry sky, but the melancholy theme is belied by banana peels strewn on the mound of dirt. “It connects to my love of comedy,” he said. Other images in the series are equally touching and funny. In one self-portrait, Aristides is seen from behind, identifiable from his signature thin, grey braid. He is gazing at an announcement – of his own death – taped to the door of the Twisp post office. Jane’s work has also been about multiple viewpoints since, as an actor and director, she contemplates different perspectives as she strives to understand her characters and what motivates them. “I was very lucky – when I got out of school with a degree in drama, I married an actor [her first husband] who was in a Broadway show,” she said. The connection enabled her to get her Actors’ Equity card within a year, and she got a part as an understudy for two roles in an off-Broadway production of Taming of the Shrew, and filled in several times during the performance. Jane discovered theater in high school when she had a role in a farce. “I remember getting a lot of laughs. The audience reaction – that’s everything,” she said. The juxtaposition of Jane’s pois ed, classical training with her droll delivery is what makes her such an effective comic actor. “The audience gives the actors the gratitude of laughter,” she said. “Opening night will be great – your friends are there, they’ve had a little to drink, they will love everything,” she said. But audiences have different personalities and moods. “You just keep going – you can sense the audience is really listening and enjoying. They’re not rustling their programs or leaving,” she said. Being in the Methow was a welcome opportunity for Jane to dedicate herself to theater again, since she had stopped auditioning for roles that would take her away from home after their son was born. She quickly got involved at the Merc Playhouse, where, in addition to acting, she produced two plays and directed one staged play and five readers’ theater productions. Although Aristides and Jane met on a movie set (she was acting; he was doing lights), being in the Methow has allowed them to work even more closely together. When Jane played a museum tour guide in the Merc’s production of Lettice and Lovage, Aristides volunteered for a non-speaking role in a family of museum-goers. “I got to see Jane do 13 performances. I saw how great an actress she was – there was only one show where they didn’t get a standing ovation,” he said. After their fruitful time in the Methow, Jane and Aristides are planning another move – albeit reluctantly. They plan to relocate to Olympia to be closer to MacLeod, his wife, and their 7-year-old granddaughter. “This is the best place I’ve lived in my life – not just the mountains, but the community. There’s something unique about this place,” said Aristides. “This was going to be my last home, where I was going to die. It’s bittersweet,” he said.